I've been wanting to make this cute little reindeer ornament since the end of February, it just took me awhile to figure out just how I wanted to do it. With the release of the Sizzix Big Shot to Stampin' Up! this summer it made it very easy to do. 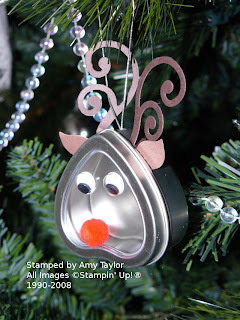 The tin is a Wilton heart favor tin that can be found at most craft stores. I had some left over from a Valentines' day project. The nose is a small red pom pom, and the eyes are wiggle eyes. The ears are made using the Stampin' Up! exclusive die Birds & Blooms, just using the wings for the bird as ears cut out of Close to Cocoa card stock. The antlers are made using the Swirls Scribbles die cut out of Chocolate Chip card stock. I attached them all with mini glue dots. The ornament is hung by punching a 1/8" hole with the Crop-a-Dile and then threading some elastic silver cord through the hole and tying a good knot to keep it closed. These would be really cute tied onto kids packages with just a little candy in it. The second thing I wanted to share today was this cute little Christmas gift bag I made. It's a white 3-1/2"x2"x6-3/4" paper sack (purchased in a package of 16 at the craft store). I trimmed off the jagged edge at the top and then covered the front and the back with strips of Holiday Treasure designer series paper. 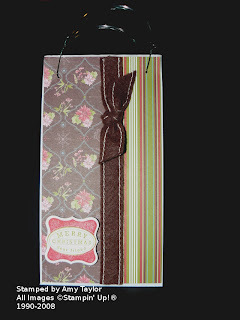 The ribbon is Alpine Ribbon Originals from the Holiday Mini catalog. To make the handles, I cut some colored wire and some pieces of left-over fish-tank tubing and threaded the wire through the tubing. Then I punches 1/16" holes into the top of the bag and secured the wire through the holes. The image on the front is the Christmas stamp from the Curly Label Punch bundle, stamped in Ruby Red ink. Really quick and cute.